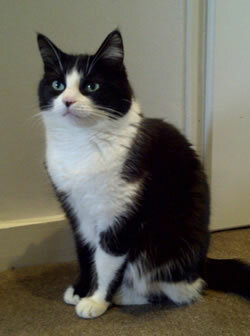 Have you seen this black & white cat from Dover House area? Sharky has been missing since 22nd December. He is extremely friendly but also very quiet. He visits other houses regularly & has even been locked in a neighbour’s house before without them realising. He also climbs inside cupboards and even cars. Please could you look around your house and garden sheds. He is micro-chipped but has no collar. His owners are desperate to get him back. Reward offered.